Make your teriyaki sauce first by mixing the sugar and dark soy sauce and tipping in to a saucepan over a medium heat. Stir till the sugar has dissolved. Let it simmer a little while longer, it should start to get a bit gloopy. Allow to cool. Then pop your chicken, chopped chilli and 4 tablespoons of the teriyaki sauce in to a sealed bag/covered bowl and pop in the fridge. Ideally leave in for 2 hours but half an hour will do it if you’re in a rush. Stir fry the chicken and any marinade lurking the bottom of your bag/bowl in a wok for 5 minutes. Top tip (learned from the Wagamama cookbook): heat your wok on the hob for a good few minutes BEFORE putting the oil in. It may start to smoke but that’s okay. Then add a blob of oil and chuck in the chicken. Sprinkle as many sesame seeds as your fancy over the chicken. Go light and you can always add more – I like to as they seem to disappear during the frying. Stir fry for a few minutes more, ensuring your chicken is golden and cooked all the way through. Serve up two bowls of rice and divide the chicken between them. 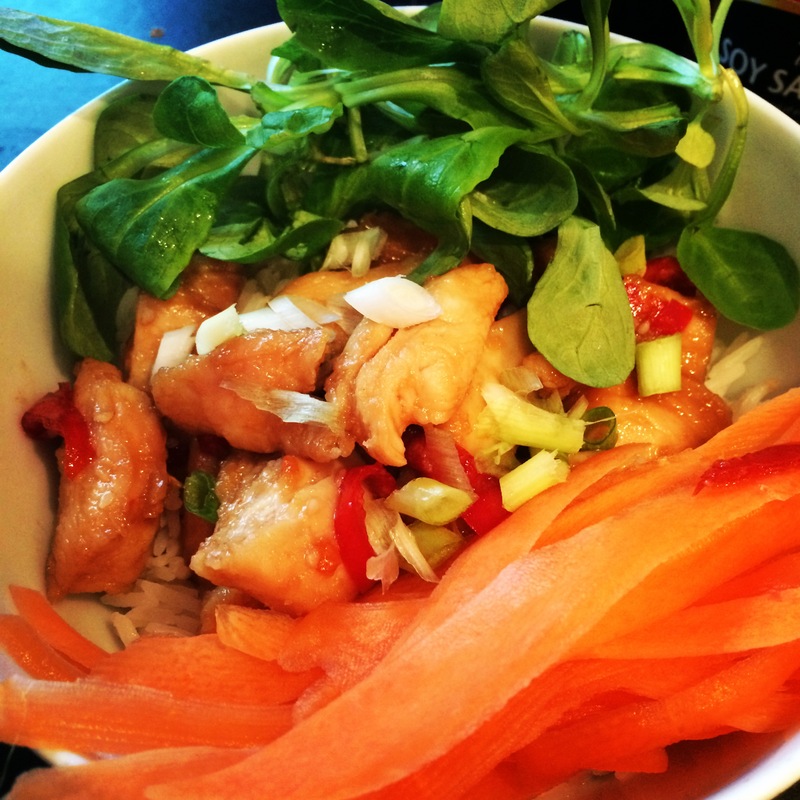 Line your chicken down the middle of the rice and top with spring onion. On either side place your carrot and greens. Psst.. If you like your dinner a little more saucy you should have some teriyaki sauce left over, which you can drizzle over as you like. I prefer a little extra soy sauce on mine though. Alternatively, the leftover teriyaki makes a great dipping sauce for anything deep-fried at a later date!